Vinyl Sheds - Who Has The Best Vinyl Sheds For Sale? Vinyl sheds are one of the most practical garden buildings; they’re lightweight and easy to assemble, yet tough and durable, and best of all they’re practically maintenance free as well. Increasingly, they are also moving away from a plastic look towards something more sophisticated and eye catching. 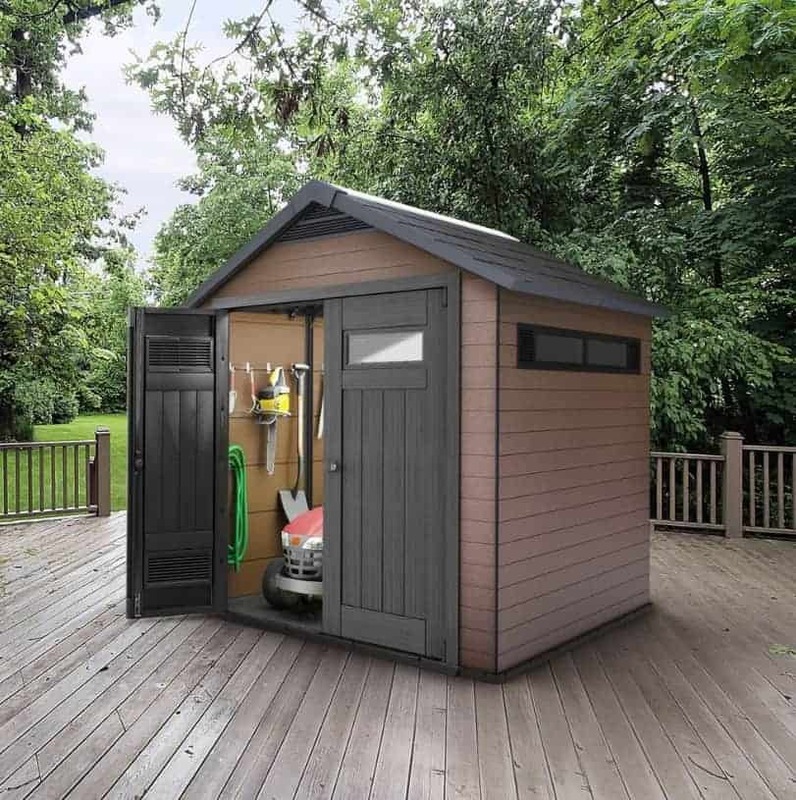 It’s sure to be a growing market in future years, as consumers look for the added value and convenience they offer, which is why WhatShed have put together this guide to the very best vinyl sheds that can be bought online in the UK today. 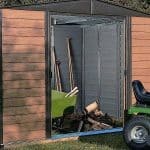 Just below we’ll reveal the criteria used for compiling this list, and although it meant that we had a relatively select number of sheds to choose from, we’re pleased to have found ten great vinyl sheds. 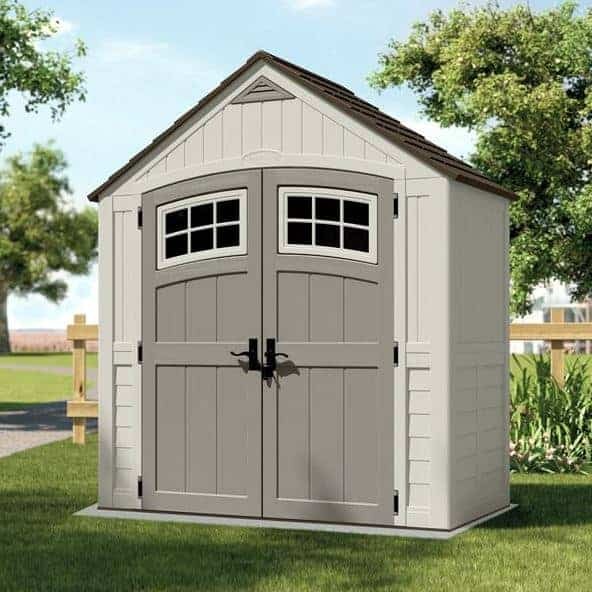 When determining positions we looked at the price and value that each shed offered, as well as any value adding features they had, and their aesthetic appeal. There are many plastic sheds on the market, so what differentiates vinyl from other plastics such as PVC? Put simply, vinyl is a high quality plastic that is often stronger and more resistant to sunlight than other plastics. There are less vinyl sheds to choose from than PVC sheds, and we have only considered sheds with a maximum base area of ten foot by eight foot, to differentiate them from vinyl garages and workshops. Nevertheless we are pleased to have found ten high quality, yet diverse, examples worthy of a place. In such a competitive category, choosing an overall winner was no easy task. Congratulations go to the Keter Oakland shed, which deservedly takes our top position as the best vinyl shed available online in the UK today. It’s large and very reasonably price, attractive, has a long guarantee, and it can even be painted if customers want to customise them. Whether you’re looking for vinyl sheds, wooden sheds, or garden buildings of any kind, WhatShed bring you the independent reviews that can help you make a smart buying choice. Vinyl sheds have many benefits to offer over traditional wooden sheds, from their durability, to their ease of assembly, and typically value for money too. This Oakland shed from Keter demonstrates all of these qualities, but it also combats the one thing that puts people off about plastic sheds – their appearance. We know that many people don’t like the idea of having anything too plastic in their garden, but this can be customised as the owner sees fit as the substrate can actually be painted. This unique feature takes this straight to the top of our top ten league table. Thanks to a special resin, these are alone in being paintable out of all the vinyl sheds we’ve reviewed, and we can imagine many people taking advantage of that. It has to be said, however, that we find their natural appearance as supplied quite attractive, and as vinyl is a very weather resistant material there’s certainly no compulsion to paint it for those who want to save time and money. We were also impressed by how much room there should be inside for the asking price, with a base area of 2.10 x 2.16m, and with a window on the side there’s a good supply of natural light inside. With a 10 year warranty as well, this adds up to a very good value purchase. We’ve been careful to include garden sheds as opposed to larger workshops in this league table, and so a base area of eight foot by ten foot makes this the largest of all the vinyl sheds to gain a place in our top ten. It’s also the most expensive, and yet thanks to its design, storage capacity and durability, we still feel this represents good value for money. 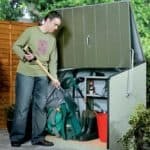 If you have a budget that extends past the thousand pound mark, and want a shed that’s large enough to walk around in in comfort as opposed to simply being a storage space, then this could be your number one choice. We were impressed not only by how large this building is, which is emphasised by the apex roof which rises up to a peak height of 2.62m, but also how strong it is likely to be. Once assembled it should feel very stable, and that’s because it’s made from double walled blow moulded vinyl resin. That makes these vinyl sheds ideal for areas that are in open spaces and that may be subject to strong winds. With lots of light coming from six skylights, a generous amount that is much more than we usually see, and a row of tiny windows on the double doors this shed is a great place to work or relax. 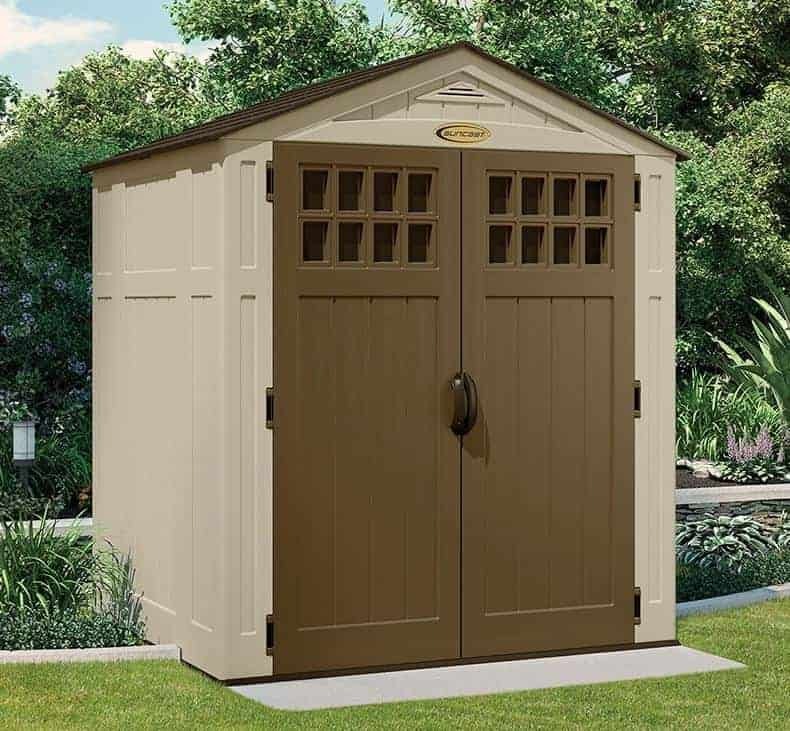 If you think that all vinyl sheds look the same, then one look at this Suncast Cascade shed could make you change your mind. It’s certainly one of the most attractive plastic sheds that we’ve seen, and as it comes with a range of other benefits and value adding features as well that helps it achieve its high position in our league table. What instantly caught our eye was the rounded design at the top of the double doors and the two windows that are integral to them. It’s a little touch, but a very effective one that’s pleasing on the eye. We always welcome the addition of windows on vinyl sheds, and on this occasion we found that they provided enough natural light for us to see clearly around the 2.13 x 1.16m interior. We were also pleased to see a built in ventilation panel to reduce condensation, and we liked the way that its grey colour scheme matches that of the double doors, and contrasts nicely with the white walls and black apex roof. This isn’t one of the larger sheds in our league table, but with a long 10 year warranty provided by the manufacturer we do feel it represents good value for money. 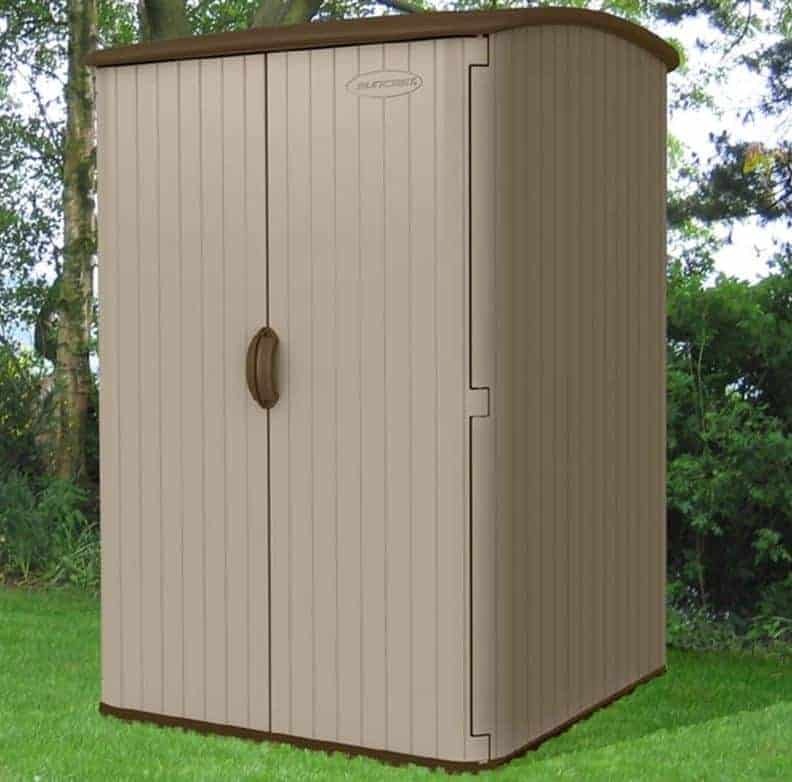 This has a look that’s distinctly different from the other Keter pent sheds we’ve reviewed, and yet we were pleased to find that it still delivered the high quality that we’ve come to associate with this brand. This is a rarity among plastic sheds in that it has a pent roof, rather than the apex roofs that we’ve got used to seeing, but that brings a couple of distinct advantages. Firstly, despite its white vinyl cladding, it has a look that is undoubtedly elegant and stylish. It caught our eye from the moment we saw it. and it’s contemporary styling should fit in particularly well with homes and gardens that have white PVC elements on show. Another advantage of the pent roof of these particular apex sheds is that they are less obtrusive than apex sheds of a similar base area, six foot by four foot in this instance. That means that it may be possible to hide it away behind a shed or fence, making it more secure. You may, of course, not want to hide this away at all, and the black detailing around the door, window, and roof can help to make this an attractive garden feature in its own right. If you want a stylish vinyl shed with the reassurance of a 10 year guarantee and a great low price then this is one that we highly recommend. 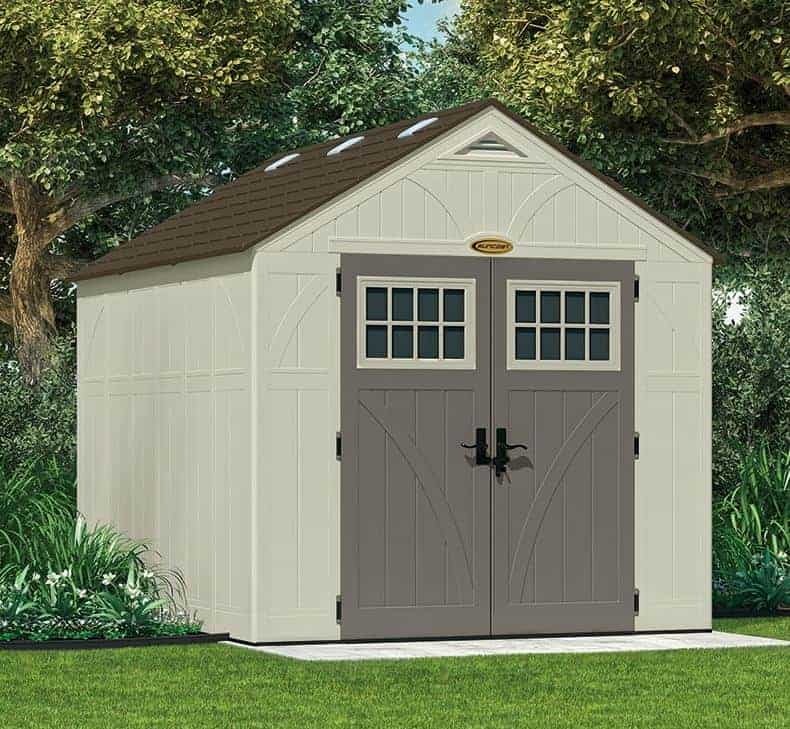 Eight foot by eight foot vinyl sheds are some of the most practical garden buildings we review, and this Keter model is perfect example why. It’s large enough to store a good amount of gardening tools and equipment, or to walk around in or relax in with the addition of a chair or two, and yet it’s not so large that it takes up too much space from the lawn itself. Being made of vinyl, which is not only weatherproof but fire proof as well, we can also imagine this being used as a safe all year round space to store motorcycles. Once again, we found the appearance of these vinyl sheds very pleasing, as whilst the walls are white in colour they have been given a woodgrain effect. That doesn’t make it look like timber, of course, but it does create an interesting look that belies the dull image that many people have of plastic sheds. Once inside you should find this more than light enough to work in, or to easily store and retrieve items, and that’s because there’s a skylight in the roof to supplement the square window on the side panel. 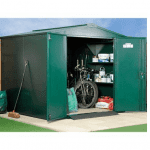 For such a well sized vinyl shed, with a 10 year warranty attached as well, this is very good value for money at less than seven hundred pounds. When we review the Suncast range of vinyl sheds, we inevitably find that they offer an attractive design, and durable and well built components. 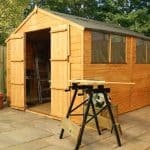 That’s certainly the case here, and as these are some of the qualities we admire most in garden buildings it’s perhaps unsurprising that this earns a place just outside the top half of our league table of the very best vinyl sheds that can currently be purchase online in the UK right now. 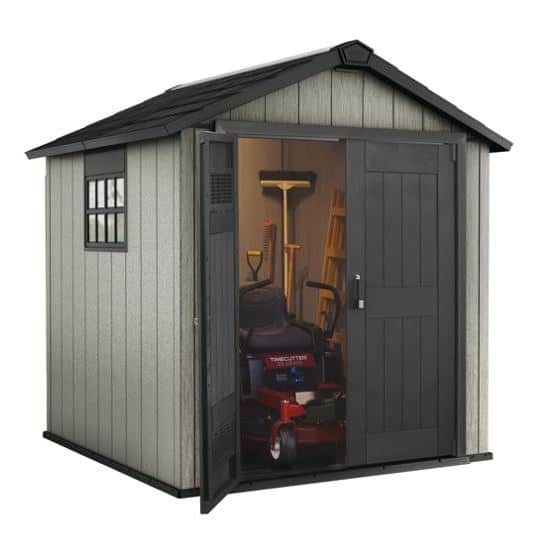 This isn’t one of the cheaper mid sized vinyl sheds we’ve reviewed, but added value is provided by the inclusion of a 10 year manufacturer’s warranty. The base area of 2.03 x 1.68m also means that there’s a more than adequate amount of storage space for a small to medium sized garden, especially as the apex roof has an accommodating ridge height of 2.24m. One of the features we liked most about this particular shed, alongside the row of tiny windows at the top of the double doors that allow light in whilst making it hard for passers by to see what’s inside, is that it has a reinforced floor. 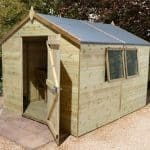 This gives the shed added stability, and it also makes it ideal for people who want to install heavy machinery and use this as a small scale workshop. Duramax make high quality and very tough vinyl sheds, although as most of them have been designed as workshops or garages we haven’t considered them for this run down of the best garden sheds made from this material. Thankfully, this unique shed does meet the criteria with a base area of 1.22 x 2.38m and a height of 1.61m. It is also the only vinyl shed in this list to come with a very long and reassuring 15 year guarantee, and it’s only the slightly higher than average price that stops this from being placed even further up. The reason that Duramax have been able to provide such a long warranty period is that this is extremely strong and durable, as well as bringing with it the immunity from rot and rust that is common to all the vinyl sheds we review. The strength comes from the fact that the vinyl cladding is placed upon a tough galvanised steel frame. Extra stability is also provided because of the lean-to design of this shed, which is unique amongst all the plastic sheds to feature in this top ten list. Being attached to a wall can also stop you having to give away any space from the garden itself, although it does make it unsuitable for those who want a stand alone shed. These vinyl sheds from Suncast have a very modern design that may not be to everyone’s taste, and we’ve taken this into consideration when considering their final position within our league table. It is original and eye catching however, and that’s something that we’re always glad to see. The shed has a base area of 1.42 x 1.24m, but the storage capacity is boosted by a ridge height of 2.03m. This relatively tall and thin design makes it ideal for smaller gardens where available space is at a premium, and we can even imagine it being installed upon a patio, balcony or decking area. There are no windows in these vinyl sheds, but this can actually be a useful security feature as it means that whatever is stored inside will be hidden away from the prying eyes of passers by. We were also pleased to see that the handles are padlock ready, so this can easily be turned into a secure storage area. We also liked the wide opening double doors that take up the complete frontage of this shed, especially as that should mean that the interior is filled with natural light when they are opened, and the curved roof which means that rainwater is quickly carried away rather than being allowed to settle on top of it. 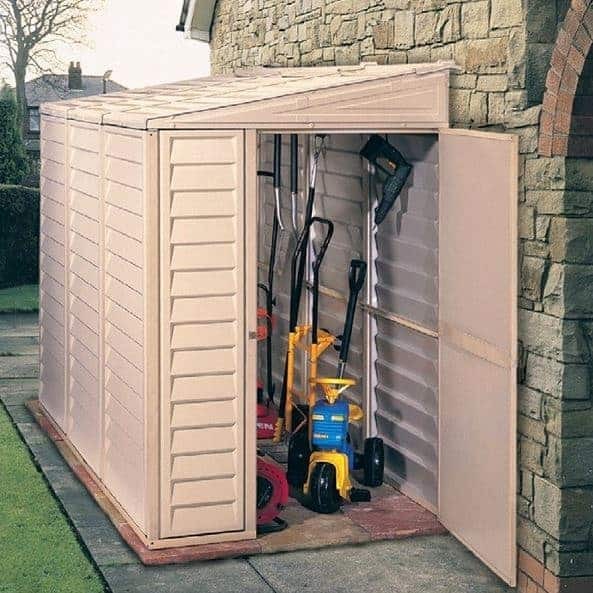 These vinyl sheds have one major difference when compared to all the other sheds in this WhatShed league table, and that is that vinyl is not the only substrate used. In fact, this shed uses a composite of both vinyl and timber for its construction, giving it the best of both worlds allied to an exciting design that we found striking. From a distance, and even relatively close up, this could easily be mistaken for a wooden shed, thanks to its brown colour scheme, with a darker brown being used for the double doors and for the shingle style roof. 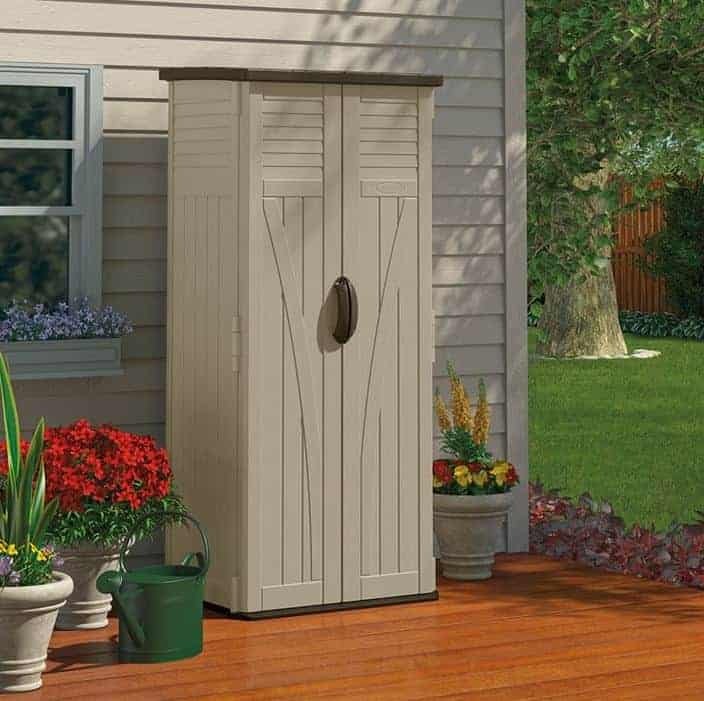 This makes it a perfect choice for people who prefer the look of traditional wooden garden sheds, especially as unlike timber sheds this one won’t need painting, staining, or treating with wood preserver. 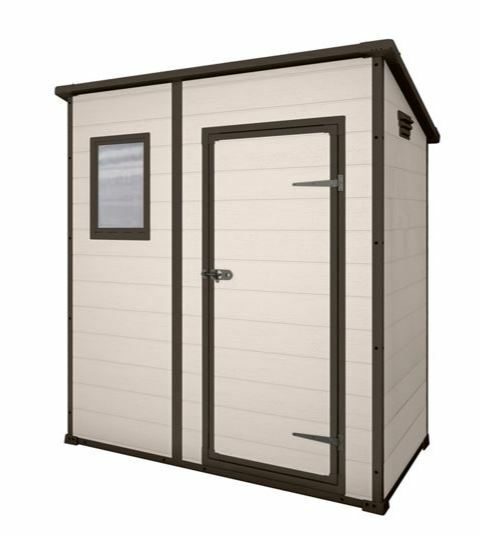 It’s not one of the cheapest vinyl sheds that we’ve reviewed, which is the only reason that it finds itself near the foot of our league table, but we were pleased to find that they do come with added value in the shape of a 10 year manufacturer’s guarantee. We also liked the inclusion of four well sized plastic windows, which is significantly more than we usually see on a vinyl shed of approximately seven and a half feet squared. 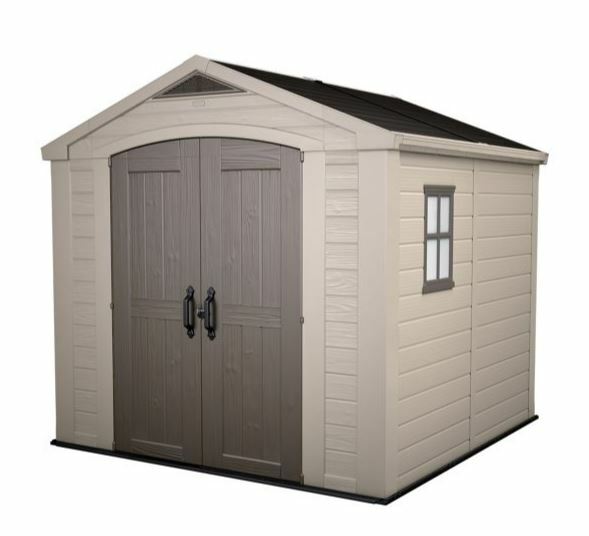 These compact vinyl sheds with a slightly curved pent roof don’t offer the storage space that all the other entrants in our top ten do, and they don’t do much to leave their plastic nature behind when it comes to their design, but they are very inexpensive at less than two hundred and fifty pounds with a 5 year limited warranty included as well. As we always strive to have sheds that suit all budgets in our league tables, we were pleased to be able to give this one the tenth and final place. In many ways the smallness of this shed is one of its greatest assets, although its base area of 0.65 x 0.82m is boosted a little by a ridge height of 1.83m. 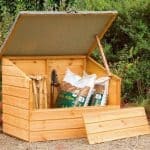 These dimensions mean that it can be positioned in even the smallest garden, and once there it will provide a very durable all weather storage facility. This can also be used as a portable shed, and we can imagine people taking it with them when they go camping in a caravan or mobile home. In common with other vinyl sheds, its fire retardant nature means that it should comply with the fire safety regulations that are commonly found now at caravan and camping parks.